For those living in damp or coastal climates, there is a hidden enemy around at all times that could be attacking your electronic devices and metallic components right now. This hidden enemy has a name, and it is one that we all know all too well - ‘Rust’. One of the things in your home that are most vulnerable to this hungry, destructive element is your garage door. Oftentimes, when people call for a technician to conduct garage door maintenance, they only do so because their system is not working properly. When the technician looks at it and finds rust on the various components, there is usually a good chance that they can be sure that this is the culprit. Rust eats away at the metal it inhabits as it grows, hollowing it, stripping it and destroying its integrity. This means that once rust settles in and spreads, the area that it was affected becomes less reliable, less capable, and more likely to give in to the pressures of your door's operation at any moment. Where is Rust Most Likely to Be Found? Rust can take hold just about anywhere on your system, anywhere with metal components anyway. The trouble is that it is often the metal components that take the most stress and require the most strength. Therefore, when rust begins to claim them, it can be bad news for your system. Your garage door springs are particularly vulnerable, along with the safety cable. These components withstand enormous pressure on a constant basis, and will fail quickly if they begin to rust. The door bearings too can be a problem. Rust will not only damage them, but could cause unnecessary friction in their movements, which will make your garage far more difficult to operate. Often enough, if the problem is not too bad, it can be solved with some sanding and lubrication maintenance to ensure that the component is adequately protected from further damages. However, there is always a chance that rust will grow back to its former malicious glory, and therefore routine maintenance is important. 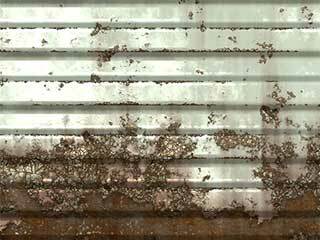 Of course, the most foolproof method of getting rid of rust is to call our experts at Garage Door Repair Pleasanton. Remember that a stitch in time saves nine, so if rust is eating away at your system, it is best to call for professional assistance as soon as possible. We're a locally-owned business with more than 10 years of experience, so you can trust us no matter what kind of service you may need. Whether you have a Liftmaster, Stanley, or just about any other type of door, we have the expertise and parts to solve your problem efficiently. At Garage Door Repair Pleasanton, your satisfaction is our guarantee! Offering same day services and top quality products, our team is always at your service.